The Well might seem like an odd name for a mixed condo-office development, until you take into account that the location has an actual water storage unit that could change how an entire Toronto neighbourhood cools its skyscrapers. 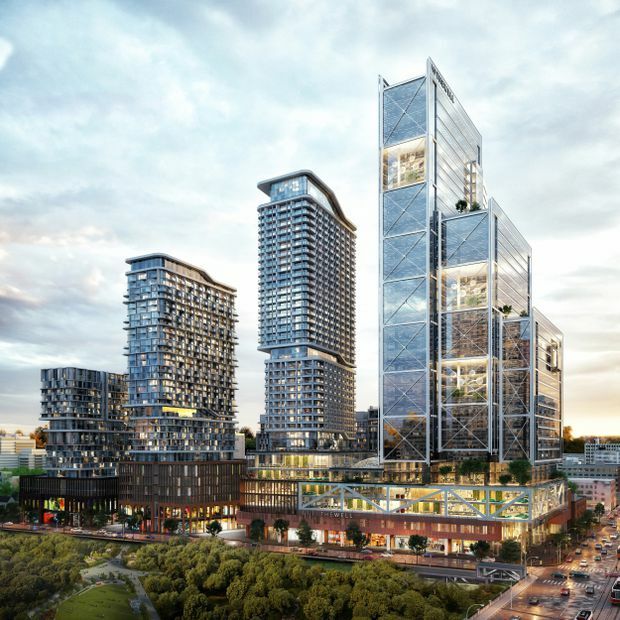 The massive new development at Front Street West and Spadina Avenue – the former location of The Globe and Mail’s headquarters – will feature a 45-storey office building, six residential towers and a sprawling retail space. Beneath it all are two six-million-litre thermal water-storage units that will house cold water from Lake Ontario that could air condition any number of large buildings in Toronto’s increasingly dense King West neighbourhood. An artist's sketch of the proposed Well condo-office development in Toronto. The project is a considerable opportunity for Enwave Energy Corp., the company that already operates lake-water cooling in Toronto, and for Allied Properties REIT, RioCan REIT and Tridel Corp., the three companies involved in the Well. Allied says that it has 20 or 30 buildings that are either under construction or already built in the King West area that could benefit from the cooling system. The company says it already saves 80 per cent on hydro costs at two of its buildings in the financial district that use the same type of cooling technology. “It can be a big competitive advantage over time for those buildings as the cost of cooling goes down,” said Allied CEO Michael Emory, who added the expansion will allow their entire office portfolio to become more sustainable with a smaller adverse impact on the environment. The technology, known as Deep Lake Water Cooling System (DLWCS), uses cold water from Lake Ontario and courses it through more than 75 buildings in Toronto’s downtown such as the Rogers Centre, various office towers and a hospital to provide air conditioning. Most skyscrapers already use water to provide heating and cooling, but with a conventional system the buildings must chill and heat the water themselves. Enwave centralizes the cooling and heating, making the entire system much more efficient. It also uses waste heat from buildings and uses it to warm tap water. All together, the system currently saves an estimated 100 million kWH of electricity a year, enough to power a 530,000-person city for an entire month, according to Enwave. The development of the Well means that the technology can expand into an entire new neighbourhood. Its water storage unit will function like a thermal battery, storing cold water that can be used when there is high demand in the King West neighbourhood. “It’s greener, you’re using renewable energy and you’re storing energy at a cheaper time at night and deploying it during the day,” Mr. Coutinho said. The growth of Toronto’s system starts to put it in a scale with other cities around the world. Dubai utilizes a massive district cooling system employed in about 1,000 buildings across the city, using water from the Persian Gulf. Tuomas Ojanpera, a spokesman for energy utility Helen Ltd. in Helsinki, says that district heating has been in use since the early 1900s in the Finnish capital, with 1,400 kilometres of heating pipes installed already. In 2000, the city started using district cooling as well, and currently services 380 buildings with the system. “Sometimes people see cooling as not a necessity, but we’ve had quite a hot summer in Helsinki, so people might see the benefits of cooling now,” Mr. Ojanpera said. In Toronto, Mr. Coutinho says that Enwave is always looking for ways to expand its technology to different parts of this city. Specific neighbourhoods are getting increasingly dense, suggesting there is opportunity for Toronto’s district cooling system to become much more widespread. The Liberty Village neighbourhood in the west end, and the Yonge and Eglinton in midtown Toronto, where a major transit development is underway, are two districts Enwave is exploring for expansion, he says.